As the debate surrounding police militarization continues to grow, some police departments are actually seeking to become more like military organizations. Some of those departments are actually even going public with their militaristic aspirations. On their website, they have an entire section dedicated to recruiting former soldiers and people with “paramilitary” experience. This year alone the California Highway Patrol has been wrapped up in a number of corruption and excessive force accusations, most notably the police officer who was recorded assaulting a woman on the side of the road, and the woman who caught an officer stealing private photographs from her phone while she was arrested on a DUI charge. 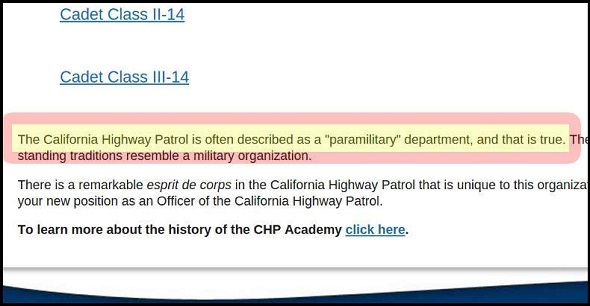 As of December 18th, 2014, the admissions of being a paramilitary organization are still displayed for all to see on the CHP’s website, but it is likely that their public relations team will restructure their website as soon as enough people point it out. 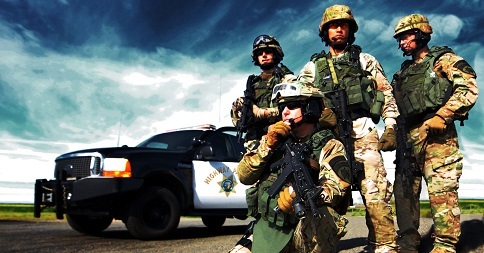 California Highway Patrol, CHP, Military, Paramilitary, Police. Bookmark. That they are trying to make law enforcement better. The government should not get involved and make things worse. On the other hand there ae allot of lawless people living w out standards. Murderers. California has it worst and allot of illegal drug trafficking problems. Too many thugs, pimps, and gangsters. We need paramilitary police … To fight crime. The issues in legislative branches should be to keep the state police out of church and families so long as they arnt blatantly violent criminals.